I went to The Seattle Fire and Sword Tournament, www.tshft.com . It was a fun and fairly competitive event. Most armies were semi-mech, and the players were generally experienced. Setup was Dawn of War and there were six objectives to claim, but you had to go after the three in the enemy side of the board to score any. I choose to go second. There was a foot fire warrior squad in ruins near the right center of the board and another at the back edge, also in ruins. I deployed my platoon, command squad and one vet squad in a Chimera. The first few turns I did well in shooting, taking out the midfield fire warrior squad, (who ran, than rallied the next turn, than died) the devilfish, and hammerheads. I did enjoy tank shocking the dismounted fire warriors off the board with a weaponless Banewolf. I threw scattered shots at the Broadsides but they were too tough and ultimately only killed sheild drones. His shooting started out slow but just got better and better, the broadsides split their fire and took out vehicle after vehicle. The capper was 3 suits deep striking into my lines, splitting fire three ways and then assaulting. By the time they showed up I had no answer and things were looking grim. I regretted having no rough riders. The kroot showed up in a corner and made a beeline for one of my objectives, and I didn’t have enough to throw at them. I almost got tabled but one vet squad clung to life, gone to ground on an objective. I managed to pull off a draw much to the disappointment of my opponent. The mission was five objectives, 3 in the midfield, 1 in each 12″ deployment zone. This was a tough game for me, I focused on minimizing the damage from the land raiders and vindicators while failing to do much against the very durable plague marines. Marines in cover proved very hard to dislodge, especially ones with FNP. Kharn and company took out a tank but then got shot to death over a few turns. My dumbest mistake was trying a lone chimera against a dismounted plague marine squad in cover, I killed one servant of nurgle and of course lost my transport and then got assaulted. Things were looking iffy, then came the big surprise: night fighting from turn 5 on. My corner castle couldn’t do much and I was pretty worried. At the last moment some plague marines failed to pop a chimera before the assault and I managed another draw, with some minor teeth-gnashing from my opponent. Corner setup, kill points. Not a good mission for guard. Normally I try not to blame the dice but even my opponent noticed how dismal my shooting was. Land raiders with smoke are pretty damn durable, heck even the smoked rhinos stood up to punishment. I was able to kill the Prince with coordinated shooting after an assault. I got multi-charged by the Lord and his Possessed, and then some summoned daemons surrounded a Chimera… and it was basically all over from there. My opponent’s army was well painted with some great conversions, and you could tell he loved the hobby. We had a good laugh that my Traitors, who were vassals of the Word Bearers, were fighting against their current masters. Once a rebel, always a rebel I suppose. My commander fled the board yet again so I assume he was pscyho-conditioned back to being a good loyal puppet, and we can assume the surviving men were sacrificed. 3 objectives, one in the center and one in each deployment zone. We had a weird deployment, you get a short edge of the board to work with and then 24″ in the center of no man’s land, then reinforcements come in on your long edge. I was skeptical but it actually made for a good game. I showed up late and my opponent had chosen to deploy first and go first, which suited me just fine. My dice were hot this game and my tanks hit a lot. This time I tried to keep my Chimeras together better so they could support one another instead of being picked off. I rushed forward the first turn with 3 chimeras, the banewolf, and the Devildog to take the center, remembering to take better advantage of popping smoke. I focused more on popping Chimeras and killing vets than challenging the heavy tanks and it paid off this time. The Deathstrike went off and I was quite worried, but fate smiled upon me and I just relieved a stun and weapon destroyed result on two vehicles. Eventually I got my meltas in the face of the LR squad and the squad rules turned against it, I got a wreck result and a weapon destroyed result, taking out both battlecannon threats at once. Turn 4 or 5 I was able to snipe the remainder of the CCS with a multi-laser and picked up my only secondary points of the tourny. Pask survived the battle but failed to inflict much damage, eventually we called it on turn 6 with me in firm control and time for the game running out. 2 objectives to one, although I still had most of my army intact. The Ogryns were late to the party and their transport got a Medusa to the face, pinning them. I then moved my Medusa away in subsequent turns and kept firing. I;m glad I took the time to scratch-build one instead of bringing my old converted basilisk. I had yet another poor round of 1st turn shooting, I think I got one rhino. With TH/SS Terminators on my doorstep turn 2 I was very worried, but after failing to reach an autocannon team I killed four of them with concentrated shooting. The last one went on to damage a Chimera before being shot down by lasguns. I was able to pop the landraider with point blank meltas. The vindicators tore out some chunks of my army although I was finally able to destroy one and kill the cannon on the other. Not destroying it came back to haunt me as it was able to contest a vital objective on the last turn. The multi-melta bikes were a major concern. 1st turn turbo boost, second turn they shot at side armor but it was over 12″ and they did nothing, turn three they assaulted and wiped out two autocannon teams. On my next turn I got my banewolf and a vet chimera, the banewolf did one wound to the bikes and I really regretted not sending it at the tactical marines in cover on an objective. The vets got somewhat lucky and killed all three bikes- three melta hits and they were gone. This was a tough game and I took longer than usual planning out my moves. There were some dramatic moments as a tactical squad tried to claim two objectives and got almost shot off but stuck around. Scouts zoomed in from the side to solidify the claim on one of the objectives that the tac squad and the sternguard were claiming. I melta cannoned a lone dismounted tac squad on another objective, reducing 6 marines to slag and forcing them to flee off the objective while my vets raced forward to claim it. My platoon foolishly tried to assault the weaponless vindicator on their home turf objective, I forgot to roll for frag grenades and I needed 6’s to hit with the melta bombs which I didn’t get. When the smoke cleared there were two objectives contested and one uncontested for each of us. A draw was only fair after that much carnage and clever positioning. I almost won but it turned out that the out of coherency marines could claim an objective just fine, which is the rules… but it irked me a little since I specifically asked and got the opposite answer from two “experts” at the table next to me. Next time I will check myself since it was a result changing issue. Commander Vezz Dragasta abandoned his men when fired upon, or stood around gloating when left unmolested. He was able to survive all 5 games! I can’t say the same for the rest of my forces, but overall I think I put in a good showing. My opponents were generally annoyed by the draws, but I figure if you deserve to win then you would have won. “If the game had gone on longer…” well it didn’t, and I played every game for the chance of a turn 5 ending. You can do an endless series of what ifs, what if my Medusa blew up your land raider turn 1? You’ve got to play for the objectives, hope for the best and deal with the dice results you get. 26 players, 5 games, 2 days. 7 people won 2.5 games as I did, 10 people did worse, 9 people did better. I’m happy I could hold my own against players with way more practice in 5th edition and solid lists. Alternate Missions / Secondaries : I wasn’t a fan of the secondary objectives and they definitely didn’t help my score. They were somewhat interesting, but unbalanced and too focused on force org stuff. The were announced during turn two (roughly) so you couldn’t do much to plan for them. The alternate objective mission is hard for guard but still works, but the alternate kill point mission “Shoot the big one” didn’t work for me. It gives you extra points for killing monstrous creatures and vehicles with AV > 50, but only after the first. So killing the one Daemon prince was just 1 KP, shoot the big one indeed. I guess it was geared to be against Nidzilla and Land Raider / Demolisher spam, but it ended up just being another lame KP mission. Scoring was slightly distorted but not too bad: Best overall (BA) won 4.5 games with 75 battle points, with 2nd overall (SW) and 3rd overall (SM) coming in with 4 games each and 71 and 77 battle points respectively. 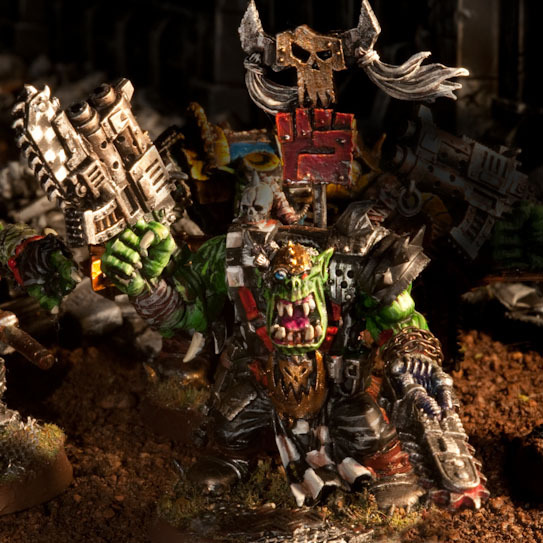 The best general (Orks) won 4 games and 78 battle points, coming in 7th overall. No one was a jerk the whole weekend. There was some occasional moaning but nothing major. Rules disputes were uncommon and never heated, if challenged on something I generally agreed with my opponent and then double checked the rulebook to make sure we were playing right. There was a problem WAAC / possible cheater player that won Best General last TSHFT that thankfully didn’t come this year, hopefully he got the message that his bullying and shenanigans aren’t welcome. The TO seemed pretty organized and on top of things, and I got the impression that he was tough but fair. I had some issues with the format (such as the missions and secondary objectives) but it worked fine. During games he was actively making the rounds to various tables as an observer which I appreciated. The armies were generally painted to a good standard, and many folks went the extra mile with conversions, themes, and detailing. There were lots of display boards and only one army wasn’t fully painted. I was hoping to take home the player’s choice prize for best appearance even though many models weren’t fully finished to my satisfaction. I ended up coming in second some batman’s joker themed eldar took the prize, although I thought the prize should have gone to the other traitor guard army if it didn’t go to me. Overall this was a worthwhile event and I would recommend it to anyone in the Seattle area. It is hosted twice a year for 40k and twice for fantasy. Hmmm…. taking the melta bombs in the infantry squads turned out to be a waste, I put them in to be able to possibly damage dreads as a tarpit unit. I’m glad the infantry platoon is small, even with only 26 models t is still cumbersome to move around and be condensed against assaults. It did okay as a tough nut to crack, it never fled and was only wiped out once. I think my original plan of one lascannon team and one autocannon team would be more effective. My foot commander did fine giving out orders but I would have liked to give his squad something to shoot with. Although… I am considering dropping a russ and other stuff to pick up a Straken unit. The devildog, medusa, and banewolf took the most fire, and with good reason as they can tear out big holes in the army if given time to do so. The medusa was unit of the match several times when it didn’t get capped. The 4 chimera meltavets will stay in although I think I will generally run them in teams of two so they do not get stranded without support, and to maximize any melta attacks. Even three BS4 point blank meltas can fail to do anything. I knew the Russes weren’t in the most optimal configuration going in but I wanted to try them out, and including some durable jack of all trades tanks seemed like a decent idea as a backup. They generally didn’t kill enough, heavy bolter shots usually got saved against and the battle cannons deviated a lot or were against targets in cover. I would hate to tear off the sponsons on one since they are modeled and painted so well, and on the other there is no question since I have sculpted tentacles. I could switch out what weapons the sponsons have more easily though. I think I will go with Demolishers next time as most armies wanted to rush me and shooting a long range battlecannon wasn’t as effective as I had hoped. The russes were useful though and generally survived until being assaulted. I really missed being able to assault and unleashing fun surprises like Marbo and outflanking sentinels. it will be hard to find the points to include them. I also want to try out psyker squads combined with mortars and sniper rifles for a fun change. This entry was posted in 40K Model Photos, Army Lists, Battle Reports, Traitor Imperial Guard, TSHFT, Warhammer 40K. Bookmark the permalink. Glad you enjoyed the event! I hope we can entice you to come again Spring of 2010! By the by, your army was awesome looking!